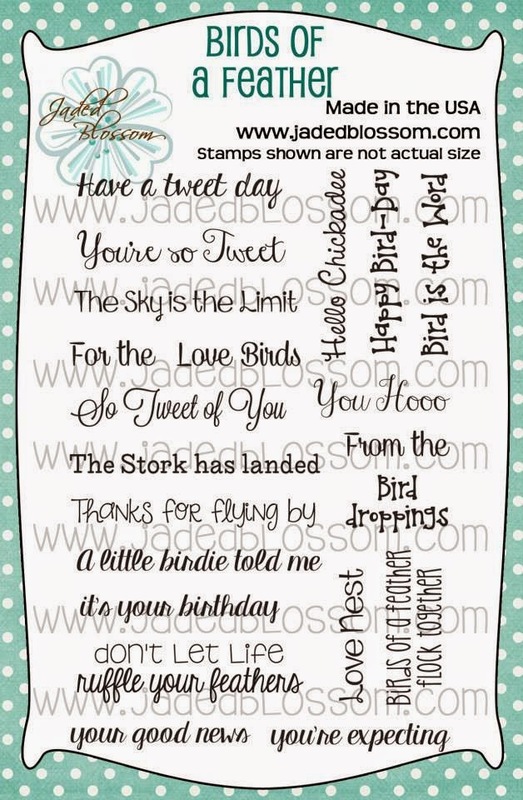 Katie Sr. here from 2CrafyKaties and it is my last day to post at Jaded Blossom. I am sad to see the month end, however, I am so thankful to Candace and Michelle for this amazing opportunity! Now on to my projects. First up we have Lucky the Leprechaun. Lucky is made from only two dies and some googly eyes! He is filled with gold Rollo's...yummy! We can't have a holiday without some poop! 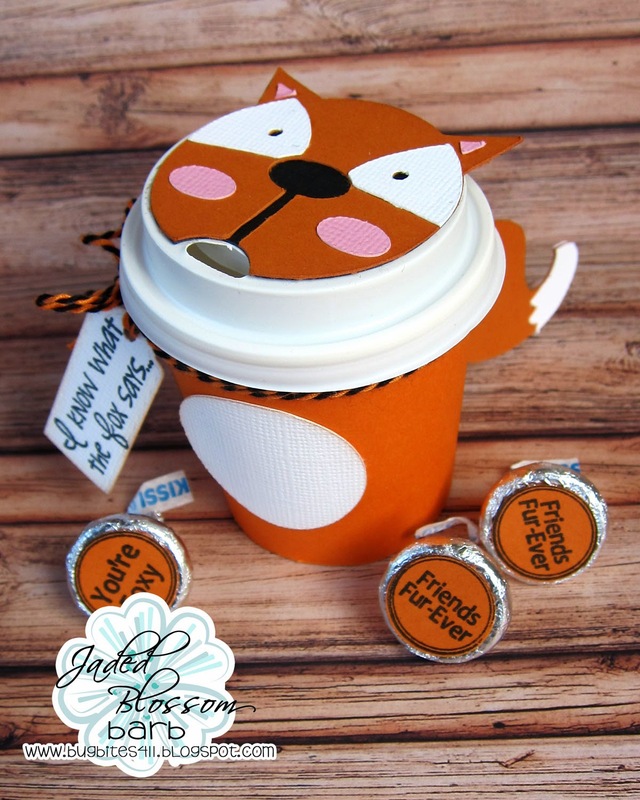 I love the many uses of the Jaded Blossom Dies. 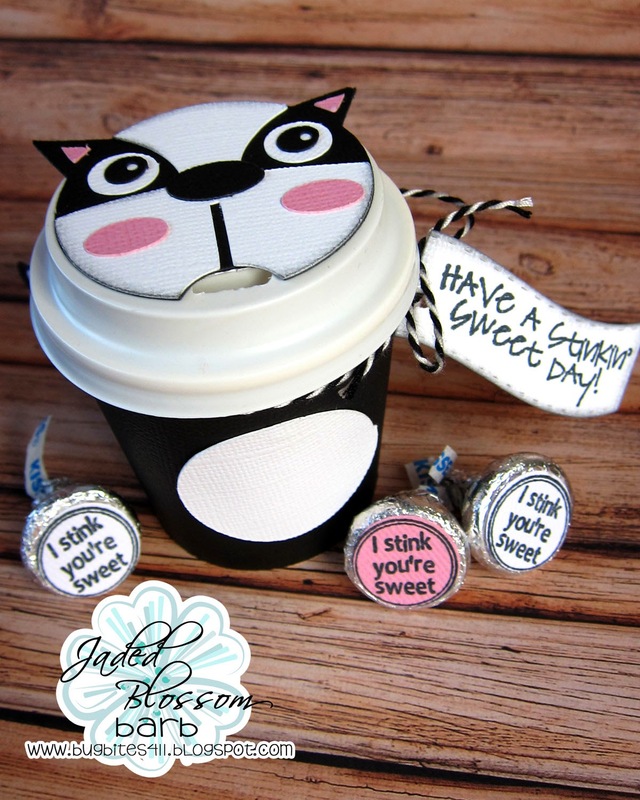 Recipe: Jaded Blossom Goody Bag Die, Mustache Die, Mini Tag Die 2, Lollipop Die & Lucky Treats Stamp Set. Hi everyone! 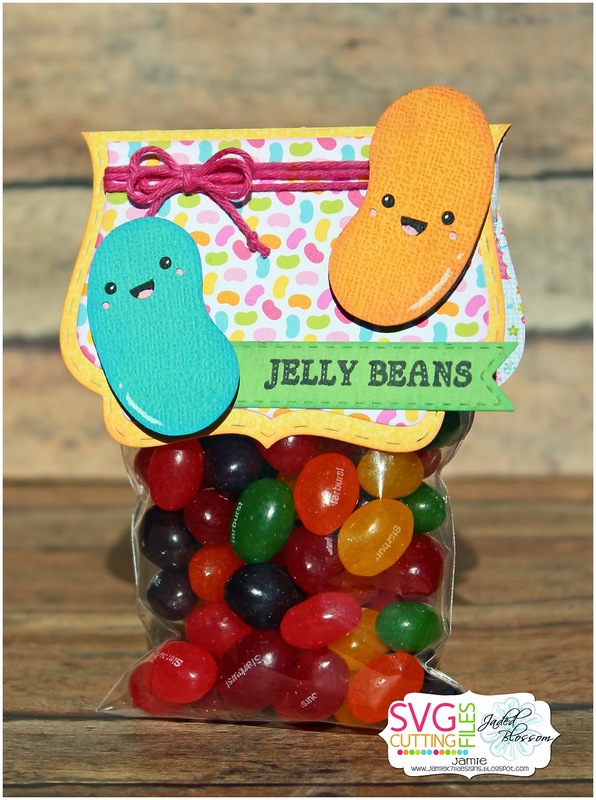 This is GiGi from The Cricut Bug and I am sharing a fun treat I made using the Monthly Spotlight stamp set- Fruity Candies. 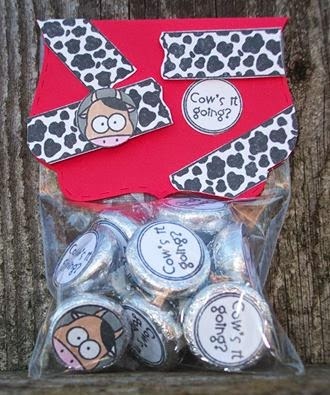 I love making little treats like this! They're just so cute! 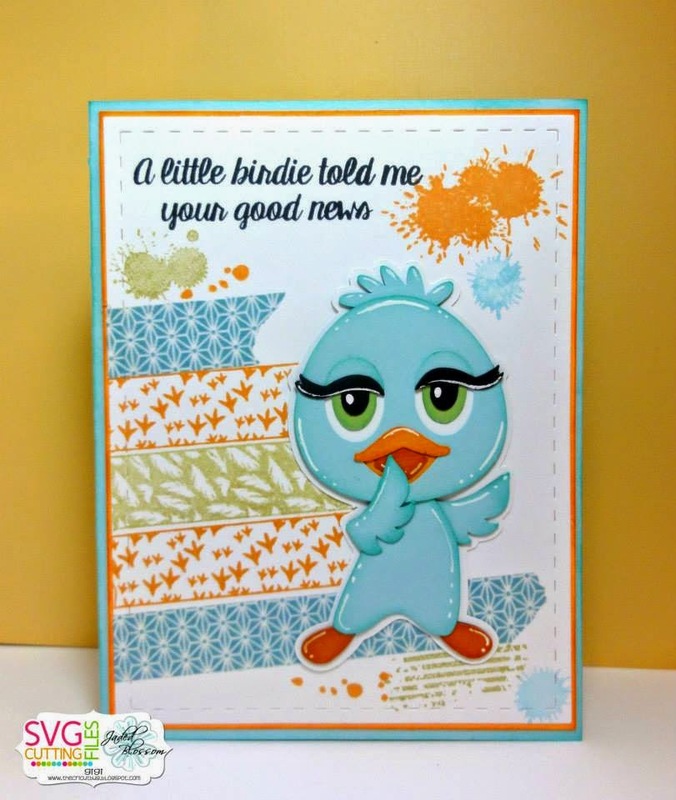 I started this project with the Layered Frame and Journal Die. 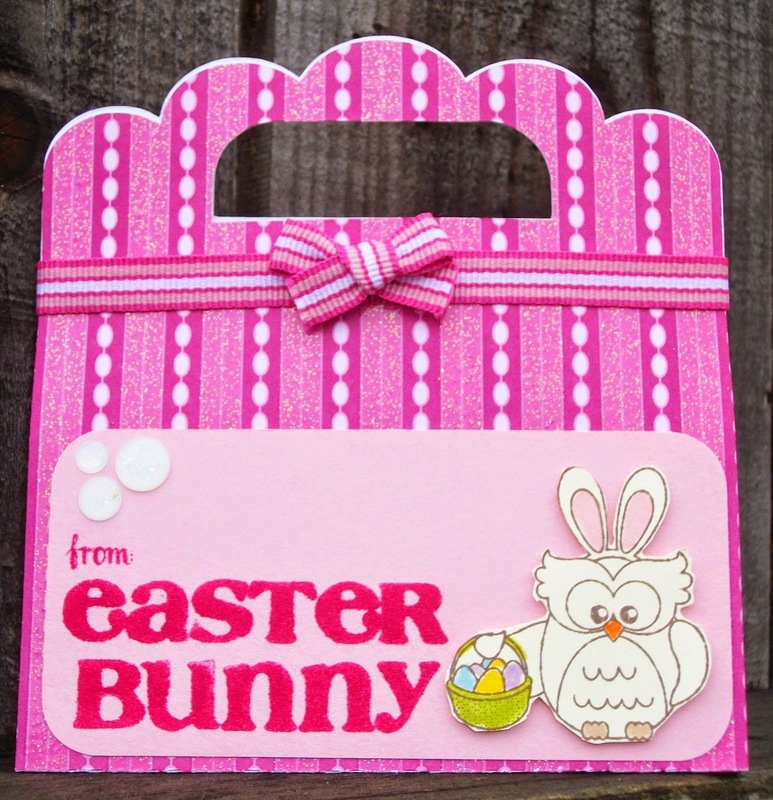 I cut out the back piece and added a piece to the top cut with the Candy Wrap Dies. 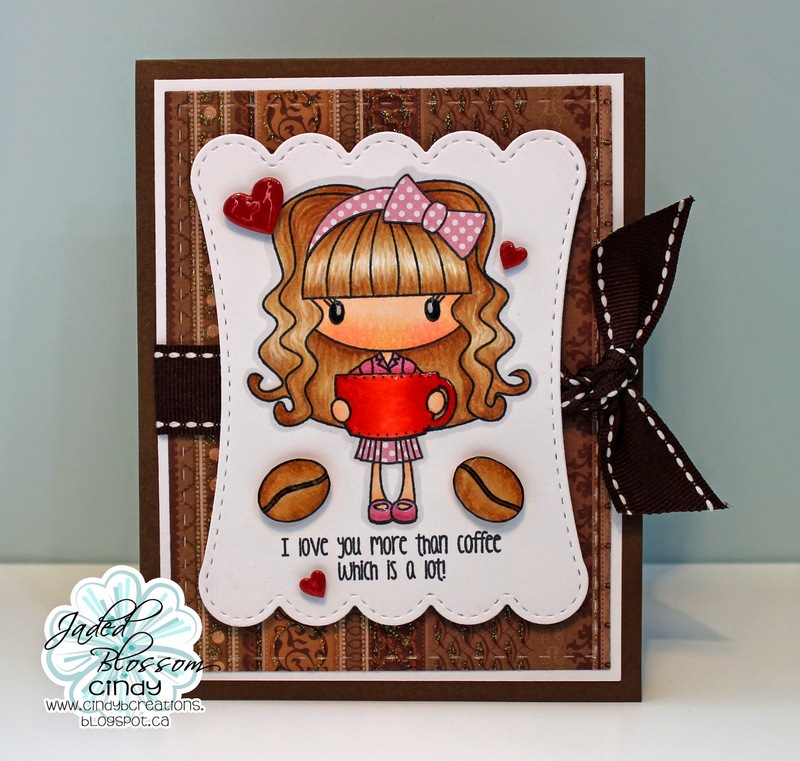 I stamped the sentiment from the Berrylicious stamp set and hand cut around it. The lemons and "Pucker Up" are from the Fruity Candies and I colored them with Copic Markers. I added a lemon mounted on a mat cut with the Candy Charms and Banner Dies to the top on pop dots. 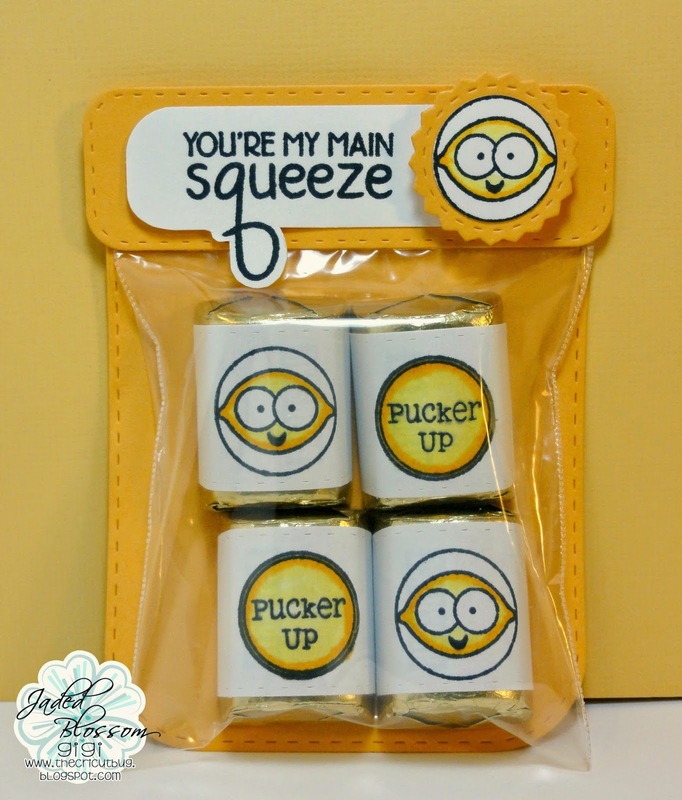 I stamped the lemons and sentiments onto the Candy Wrap Dies and used them to cover the Nugget Candy. 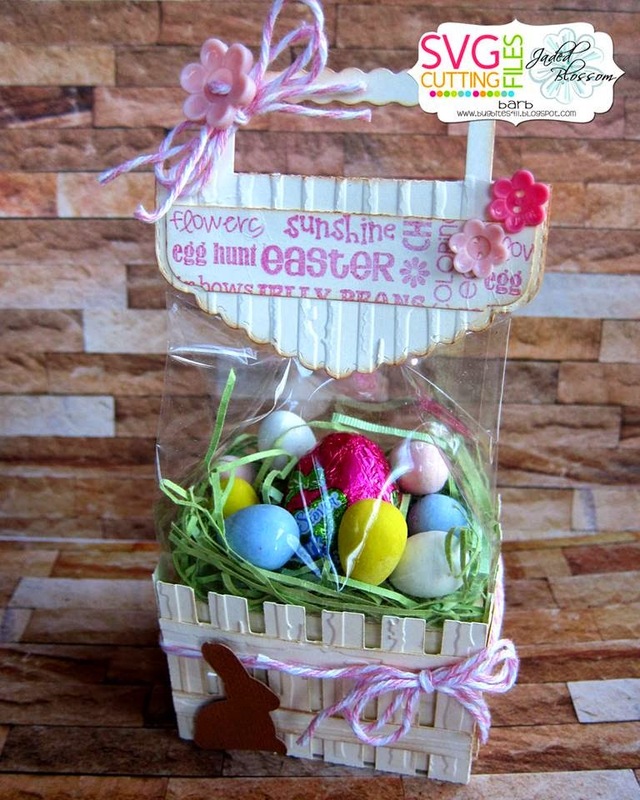 To finish, I added the candy to a 3 X 4 inch Clear Bag and stapled it to the back mat. 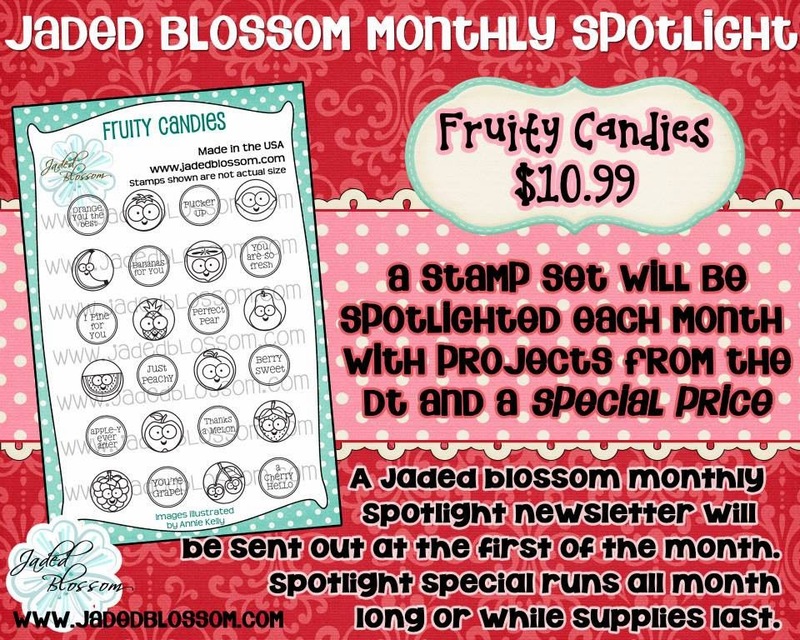 Don't forget to get the Fruity Candies at a wonderful price this month for the Monthly Spotlight stamp set. You still have a couple of days left. 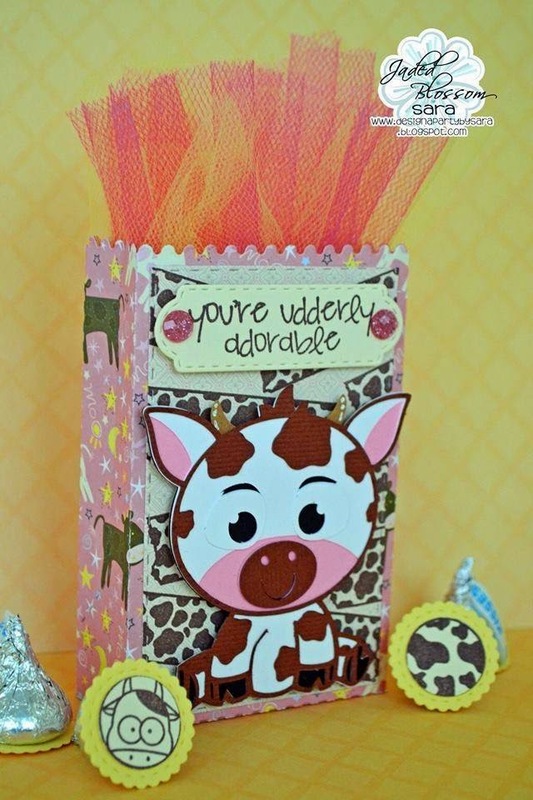 Lastly, come play along in the VALENTINE TREAT challenge! 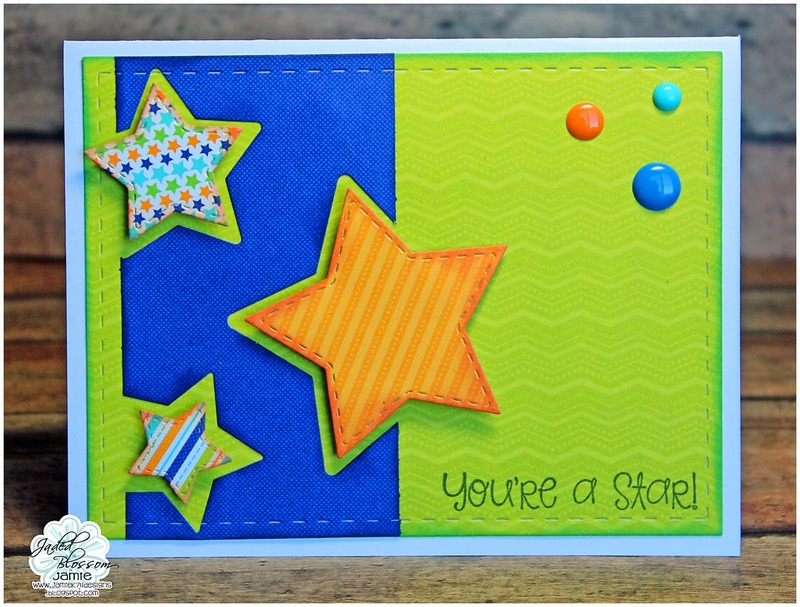 I created a card with the Card Mat Dies and Star Dies. I pop dotted the stars to create some dimension. 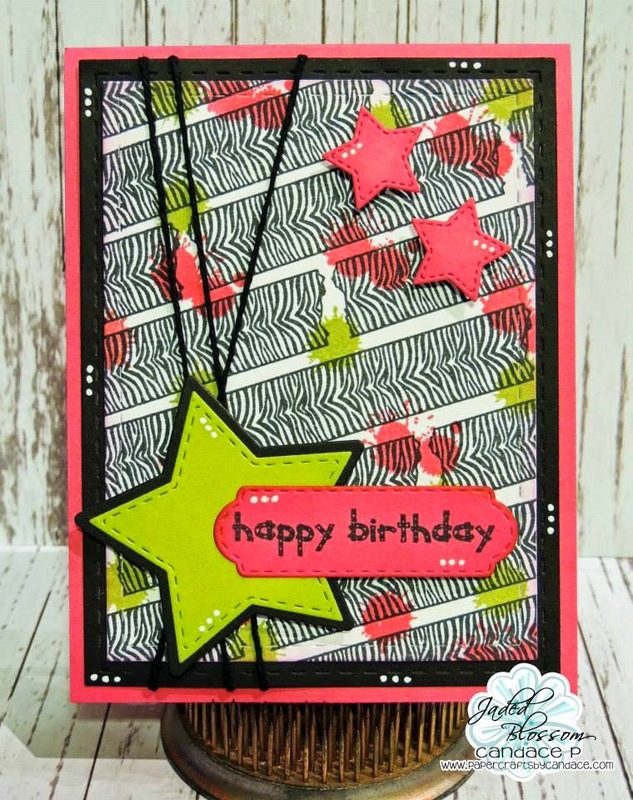 I used a sentiment from Superstar and finished off the card with some sprinkles. 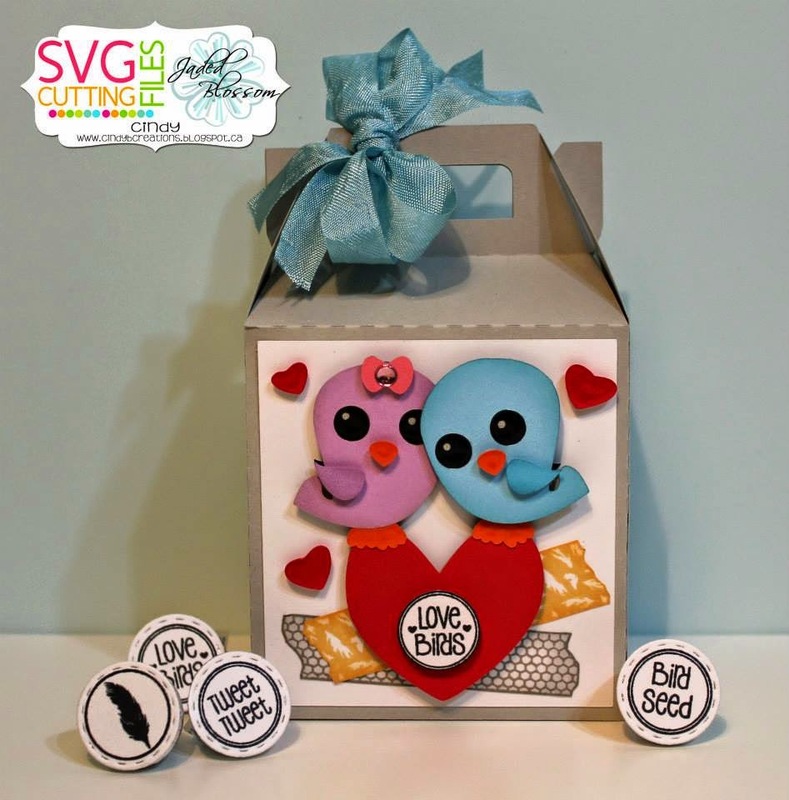 Hi it's Sara with Design a Party by Sara! Today is my day to share with you a project that I made for my boys room. I wanted to make something for their bedroom door, so I decided to make a door tag. 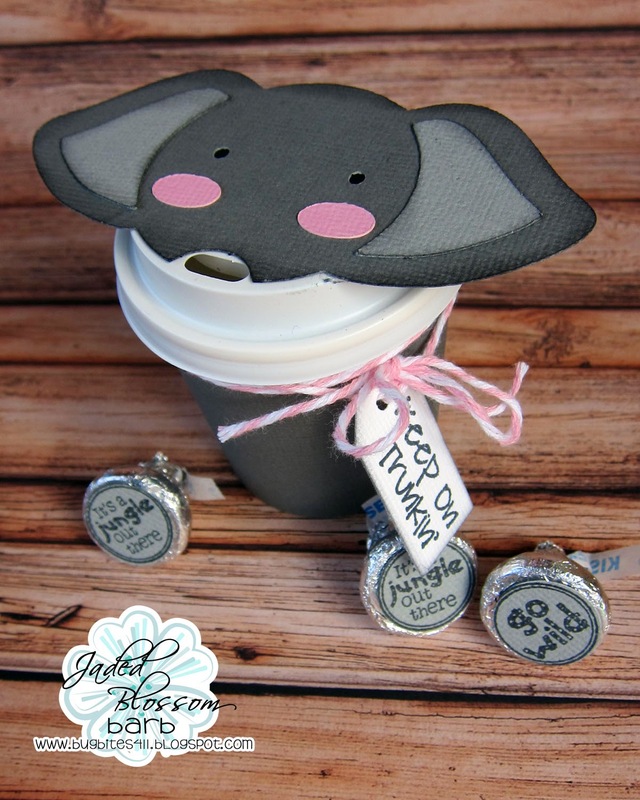 I used the Wine Tag Die! Who would have thought! But this tag makes a perfect door tag. That is the fun thing about the Jaded Blossom dies. 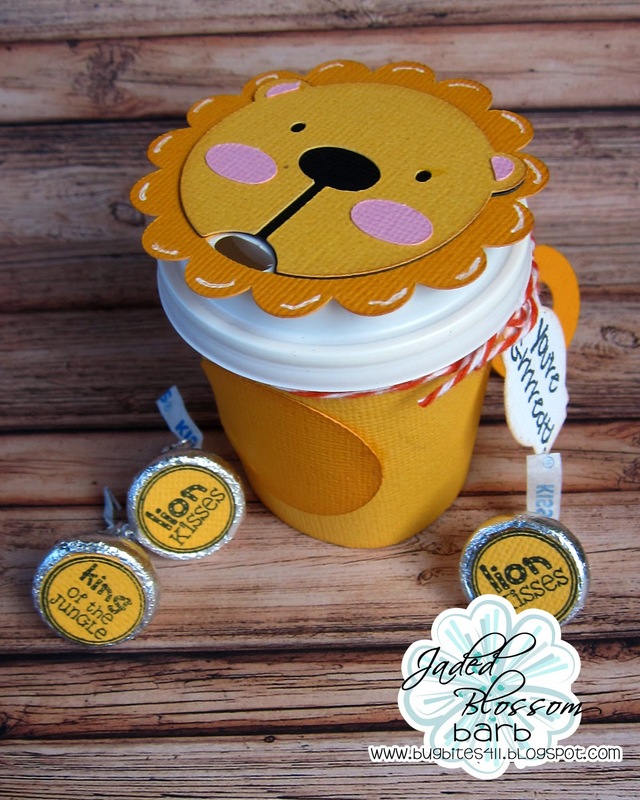 There are so many uses, it's fun to use them to make unusual creations. 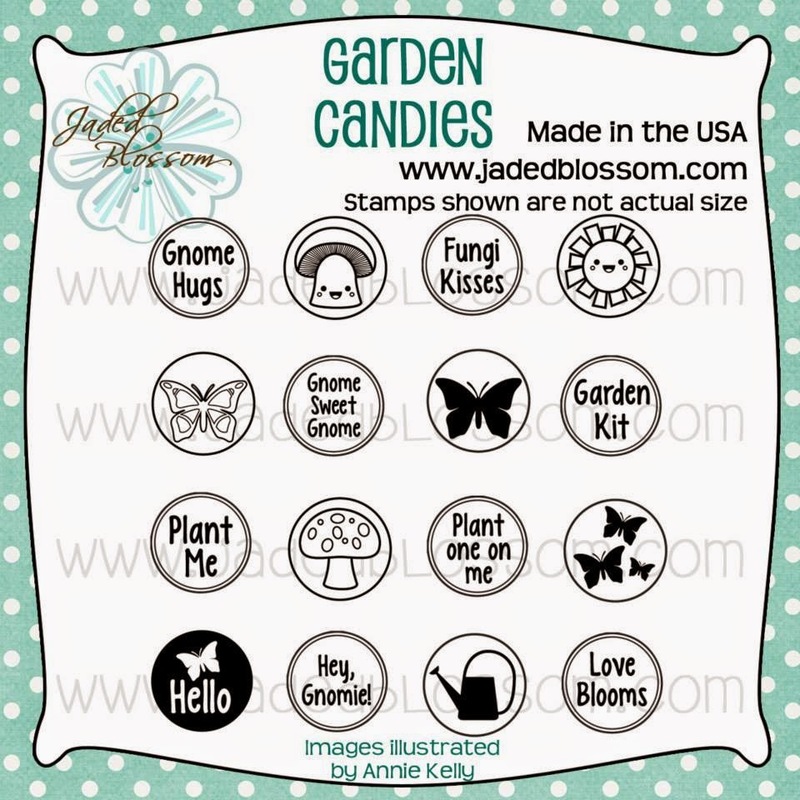 The Jaded Blossom products that I used were the Wine Tag Die, Star Dies, Card Mat Dies, Super Hero stamp set, We Go Together Like 2, and the Detective Candies. 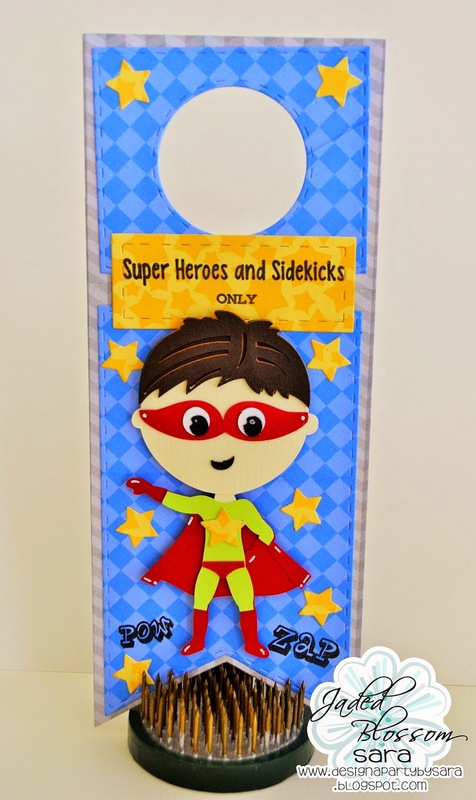 The SVG super hero is from Miss Kate Cuttables. I cut him out at 3in. 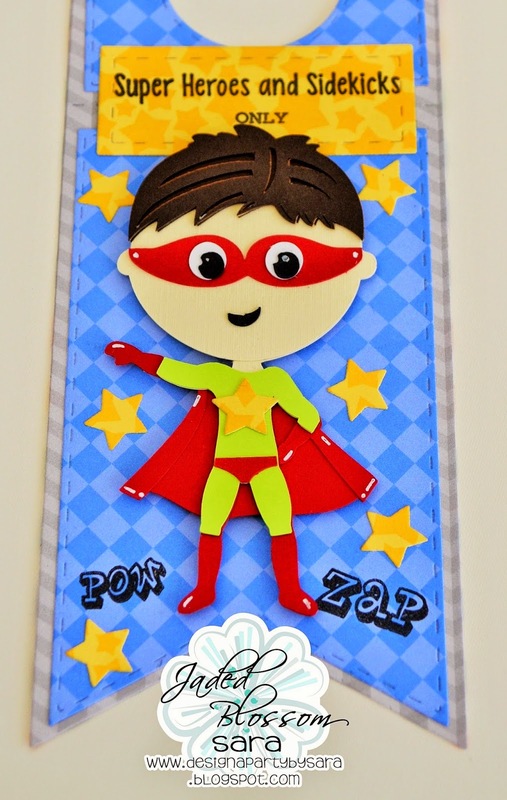 I used the POW and ZAP sentiments from the Super Hero stamp set. 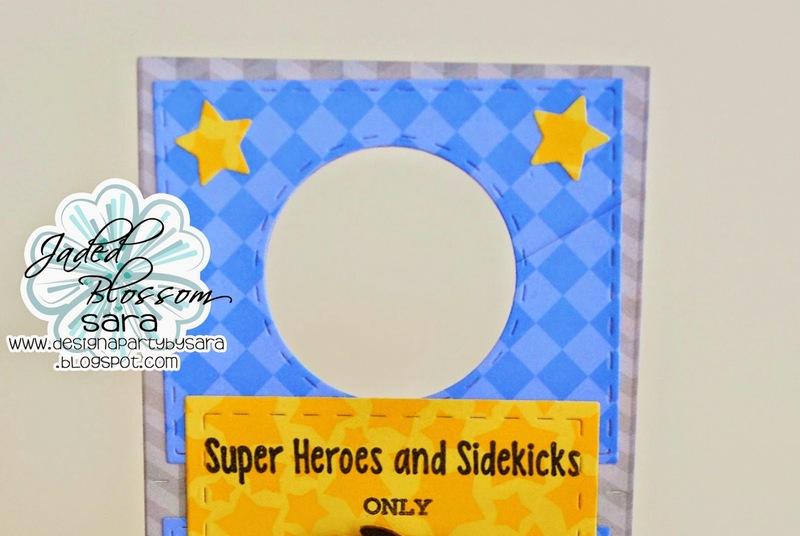 I wanted to use a tag for my Super Hero and Sidekicks Only sentiment to make it pop so I used a die from the Card Mat Dies. Of course no one but Super Heros and Sidekicks are allowed into the boys room so I needed the word only. I searched the sentiment data base and found it in the Detective Candies stamp set. I used tape to cover everything but the word only, inked it, then took the tap off and stamped. 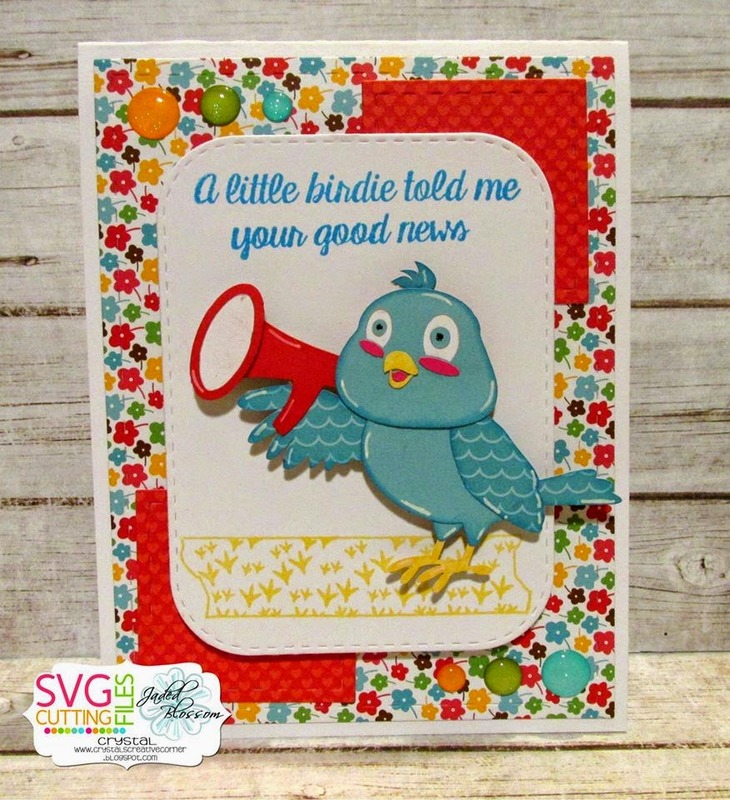 Now we have the one sentiment using two different stamp sets! To turn it into a door hanger I cut a slit on an angle on the right side of circle. Now it can slip right onto the door knob! I am so happy with the way it turned out and the boys loved it! 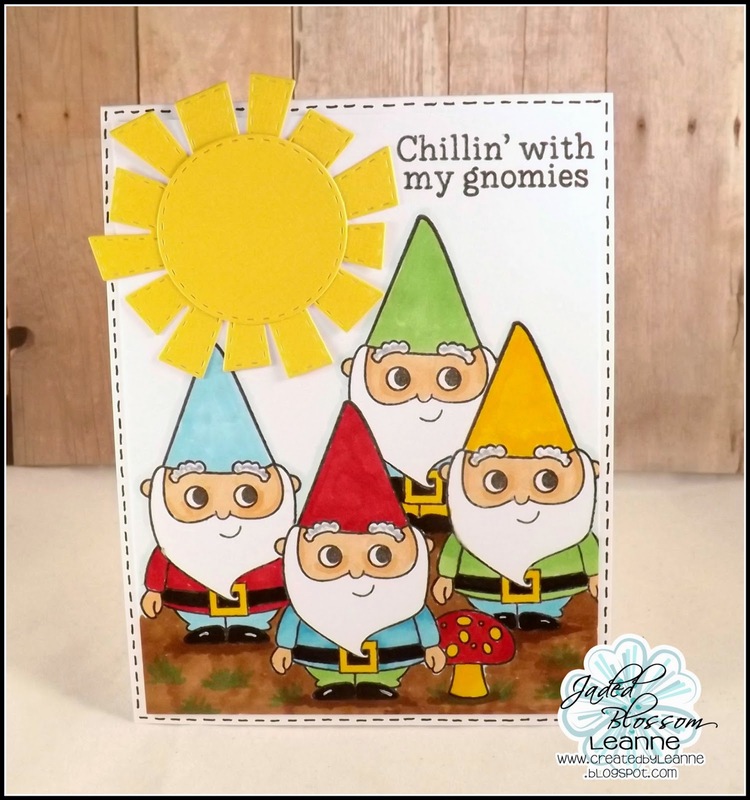 I have a fun card to share with you today using one of the newest sets, Gnomies Forever! 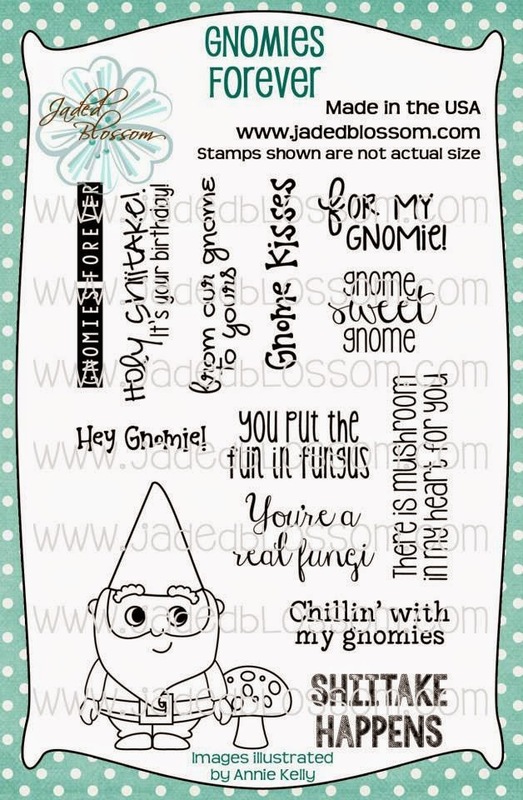 I'm so in love with this cute gnome! He just puts a smile all over my face! I stamped him once to make a mask and then four more times to make my little group of gnomies. I colored each one in different colors using my copic markers. I made the ground and grass also using my markers. 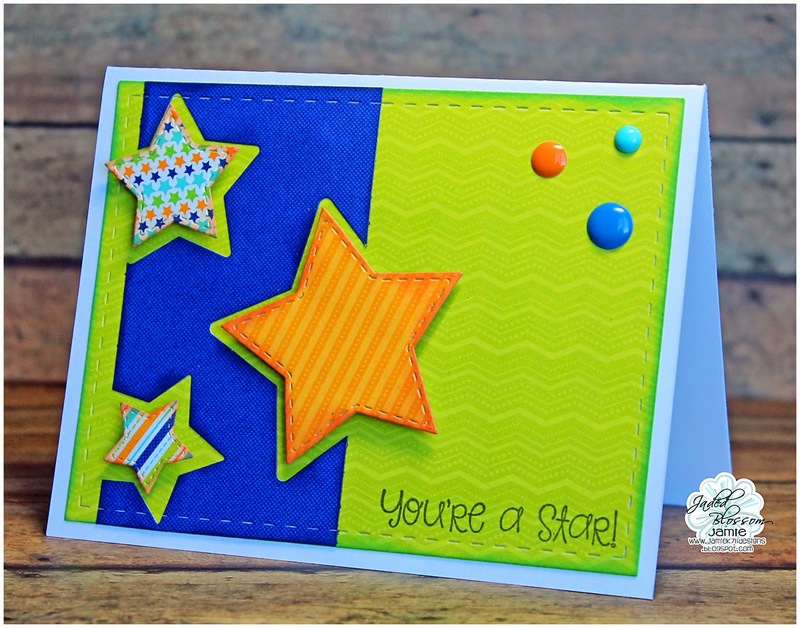 The sun (which I LOVE too hee hee) is from the new Spring Dies 2 set. 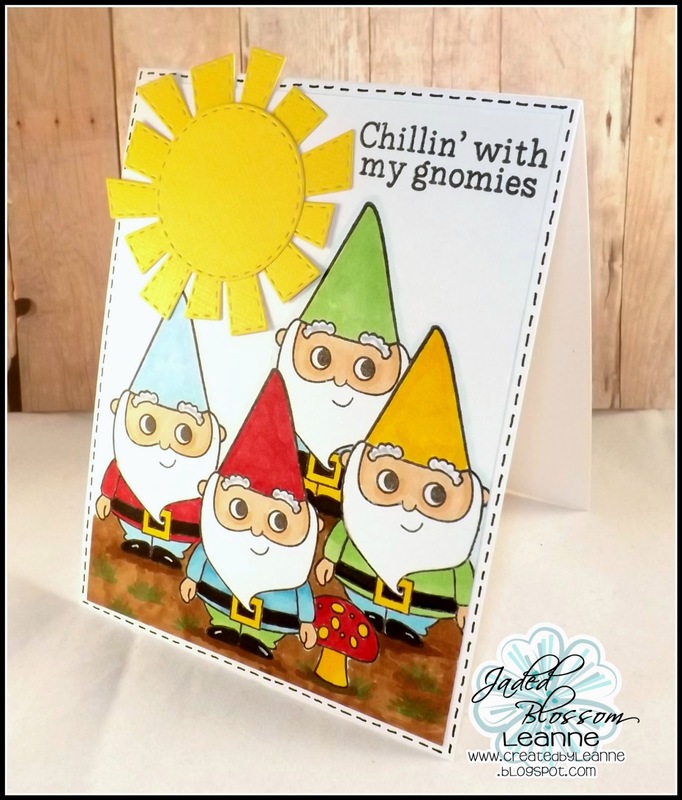 The sentiment is also from the Gnomies Forever set. Last, I added some faux stitching using my black zig pen. Thanks for stopping by and I hope you all have a AWESOME Monday! 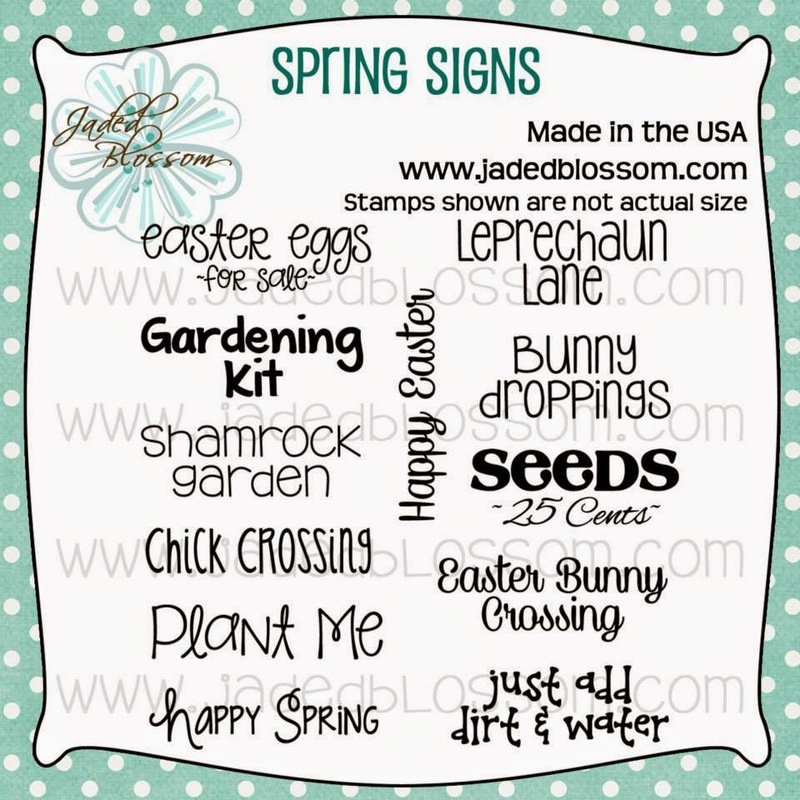 Katie here, and I am so excited to be the Jaded Blossom Guest Designer for the month of February! 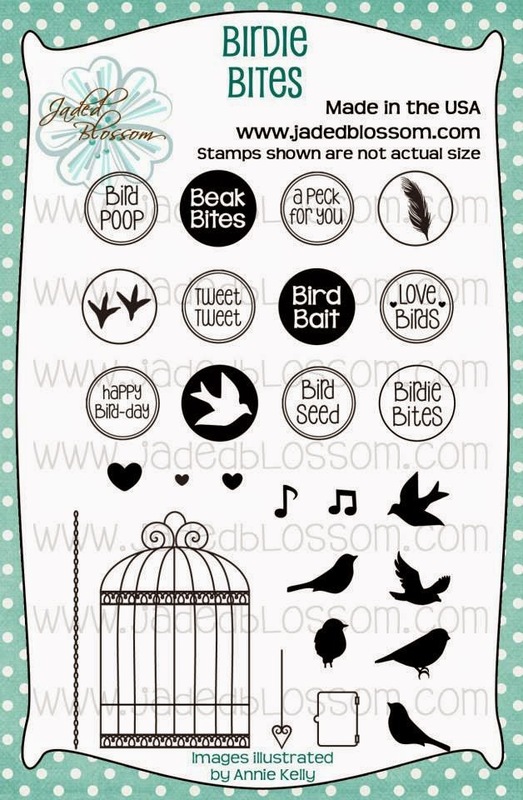 JB has the best stamps! 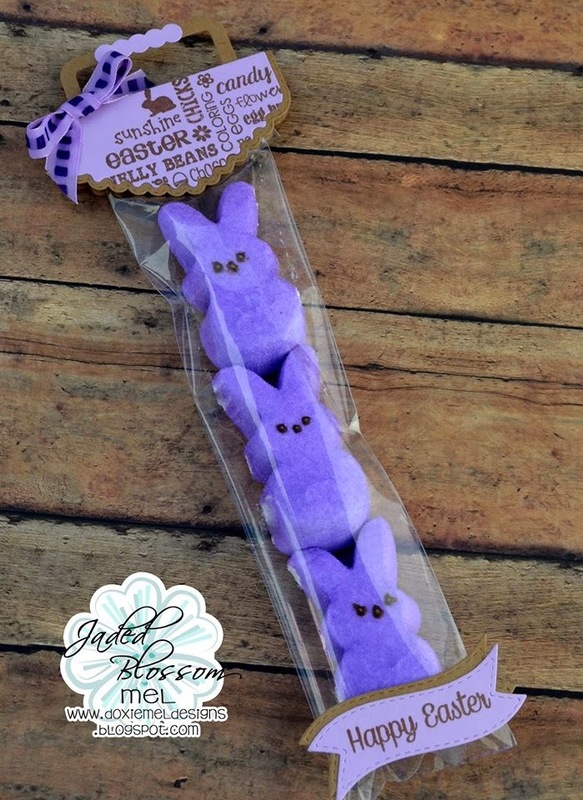 For today’s post I made my kids Easter Treats. The pink Handled Candy Pocket is for my daughter Genny. The blue Handled Candy Pocket is for my son Chris. Inside I have made Bingo and Tic Tac Toe games. 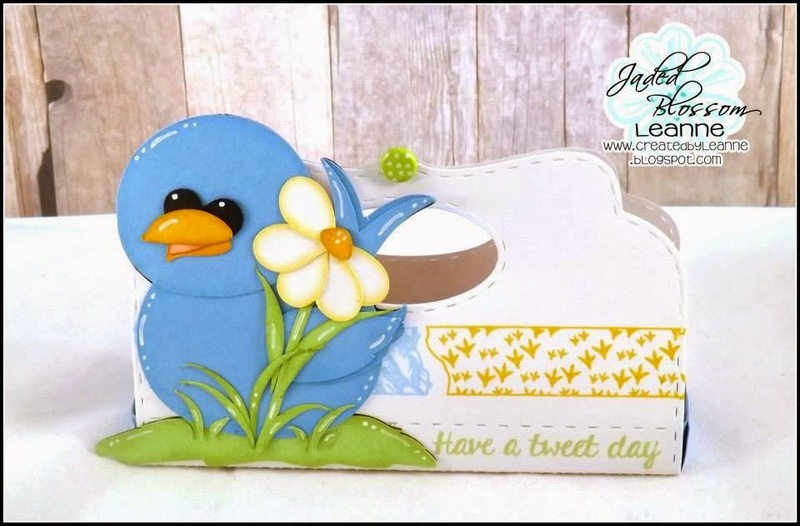 Before we get to Mel's Project for today, it's time to announce the winners of the February Blog Hop! Our first winner is... Congrats to both winners! Congrats on the release! These are great! 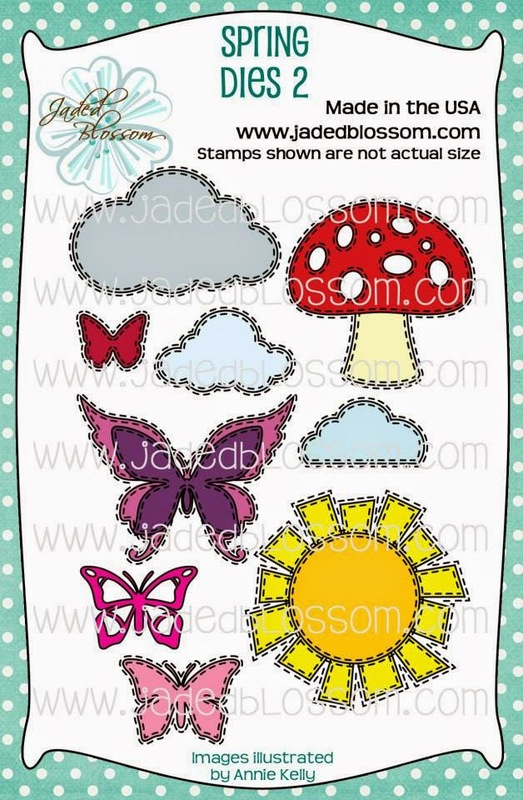 Please email us at admin@jadedblossom.com to claim your prize! Hello Everyone! Mel from Doxie Mel Designs with a new favor today. 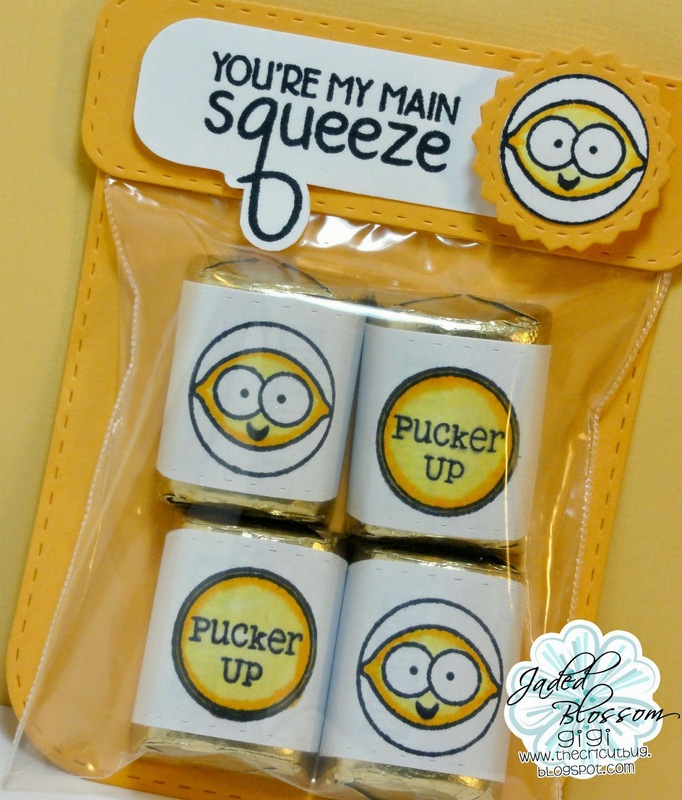 I have a project with the "Spotlight Stamp" set, Fruity Candies. 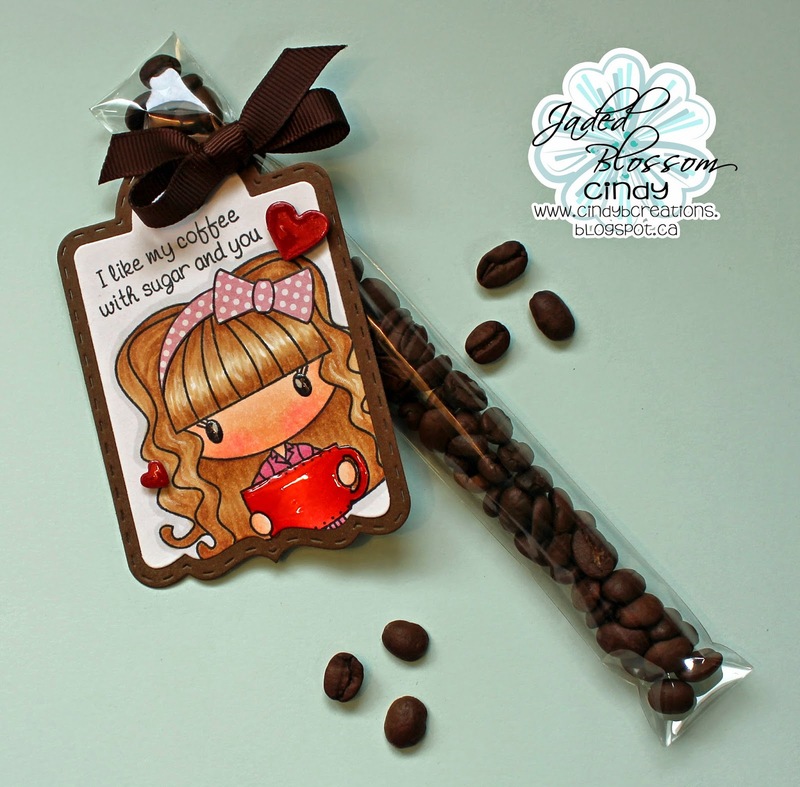 (which means Fruity Candies is on SALE while supplies last) The fruit icons and sentiments are so cute on this stamp set! 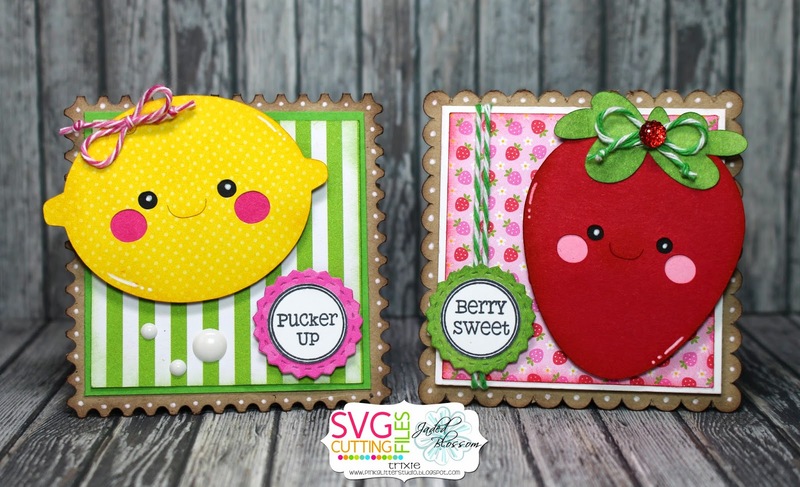 To make these fruity lollipop covers, I stamped the fruit on one of the Card Mat Dies. 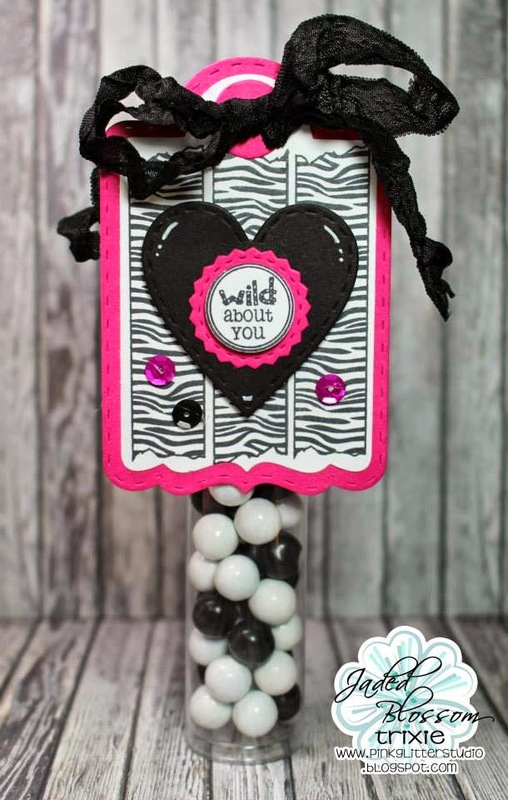 The sentiments are stamped and punched with a 3/4 inch punch and then glued on top of a Candy Charm Die. 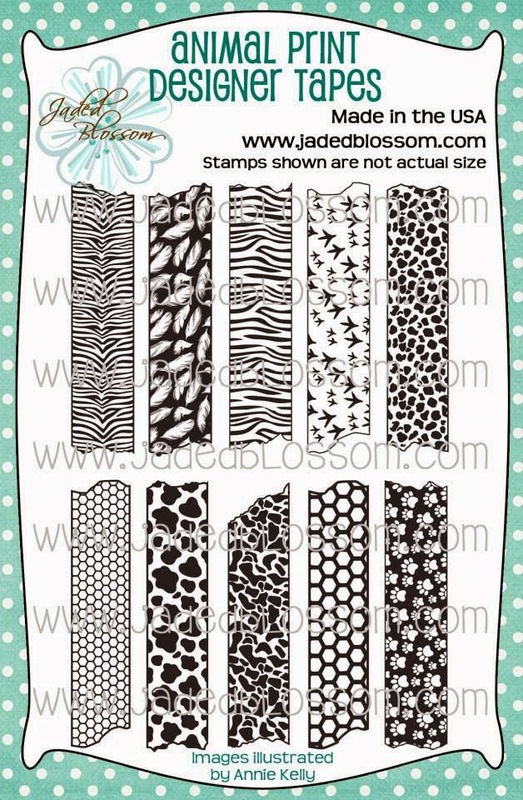 Today is my last post here on Jaded Blossom Blog. 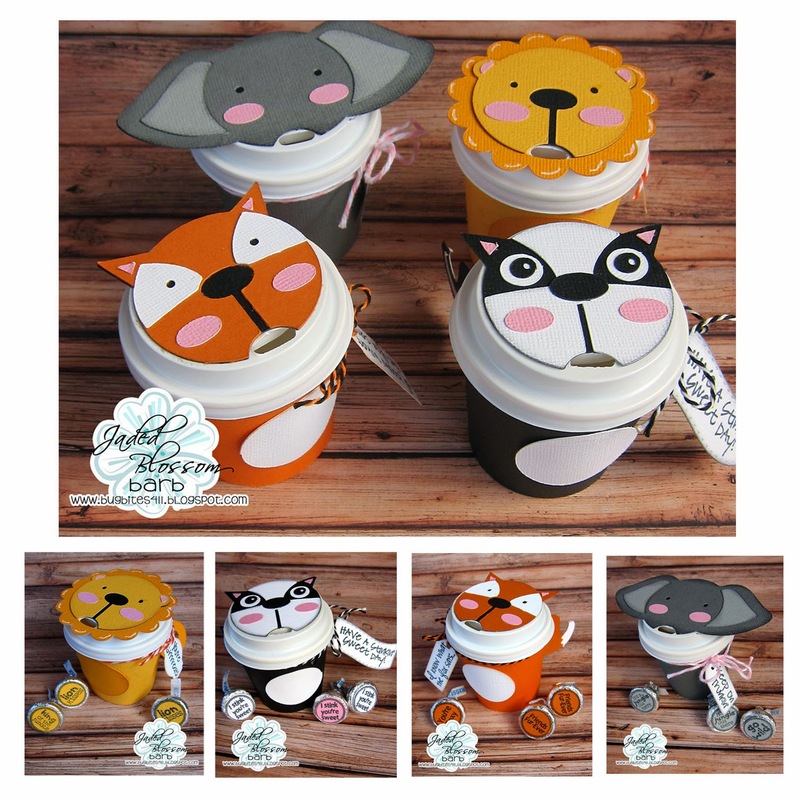 With my kids getting older and being involved in more and more things, I'm finding it hard to squeeze in crafting time. I want to thank Candace and Michelle for letting me be apart of this AMAZING Design Team. I will miss everyone so very much!! But I will still be around in the Jaded Blossom Garden. 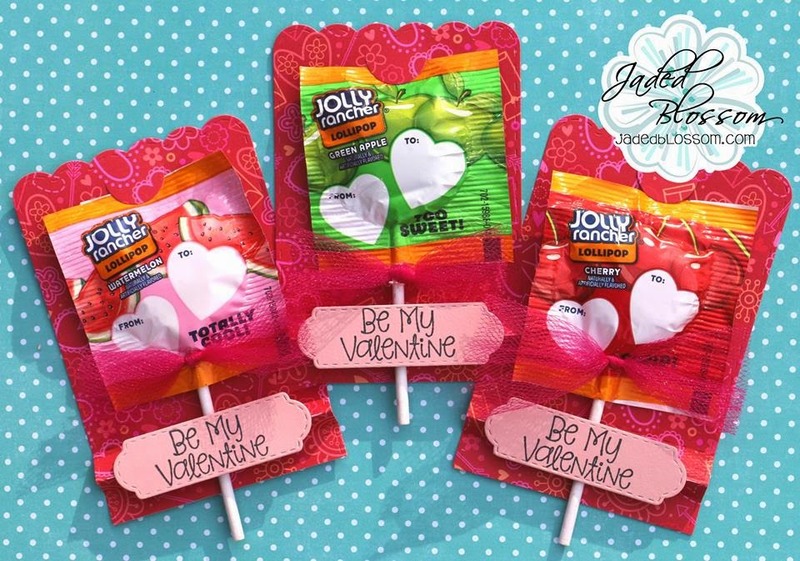 Today I used the Stamp of the Month "Fruity Candies" for my 3x3 note cards. 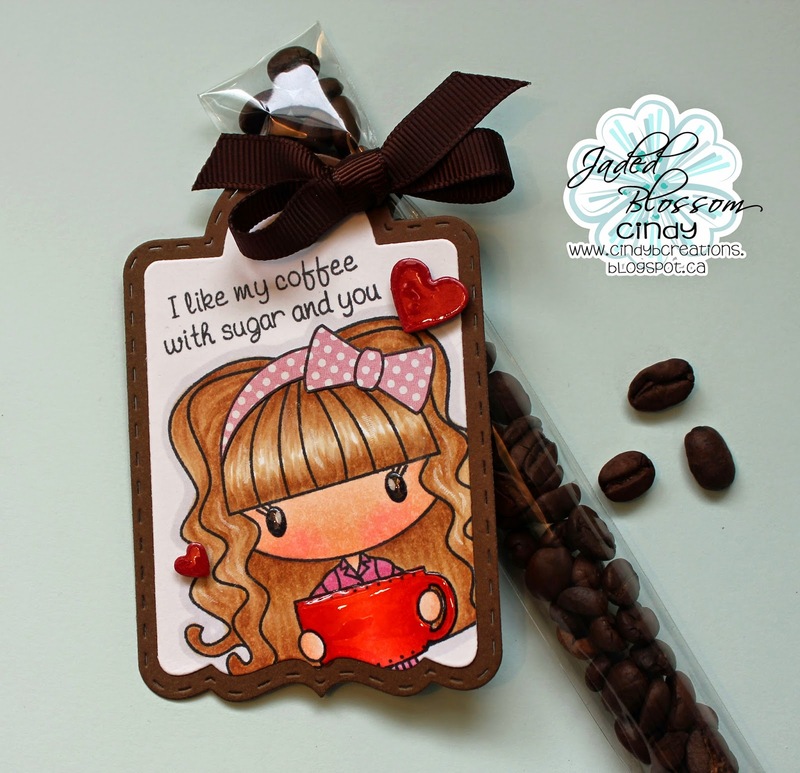 I stamped the sentiments and put them on one of the dies from Candy Charms and Banner Dies. 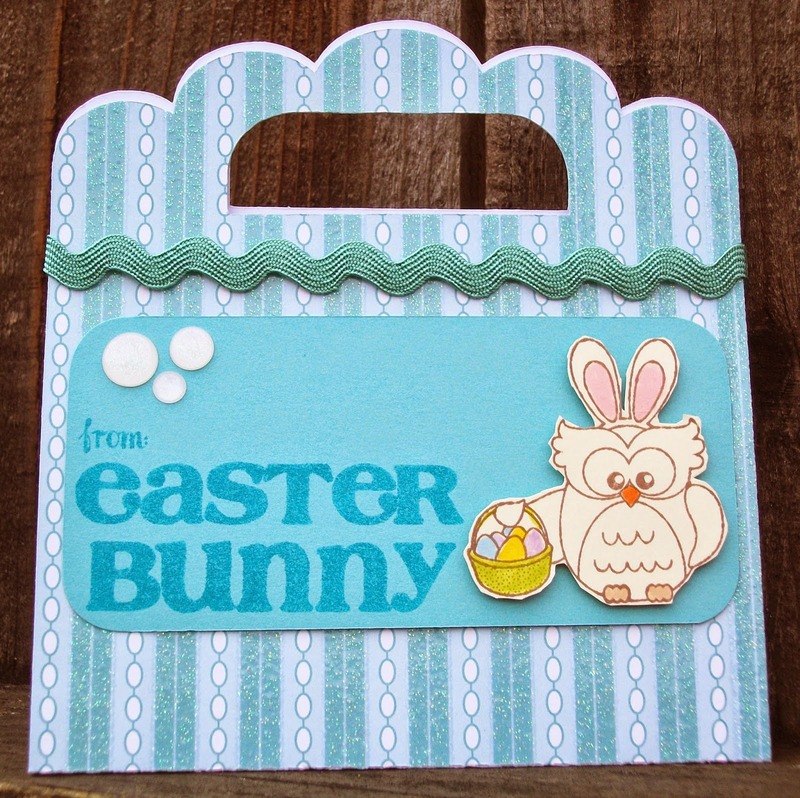 I also used the Mini Note Card and Nerdy Fruit files from SVG Cutting Files. 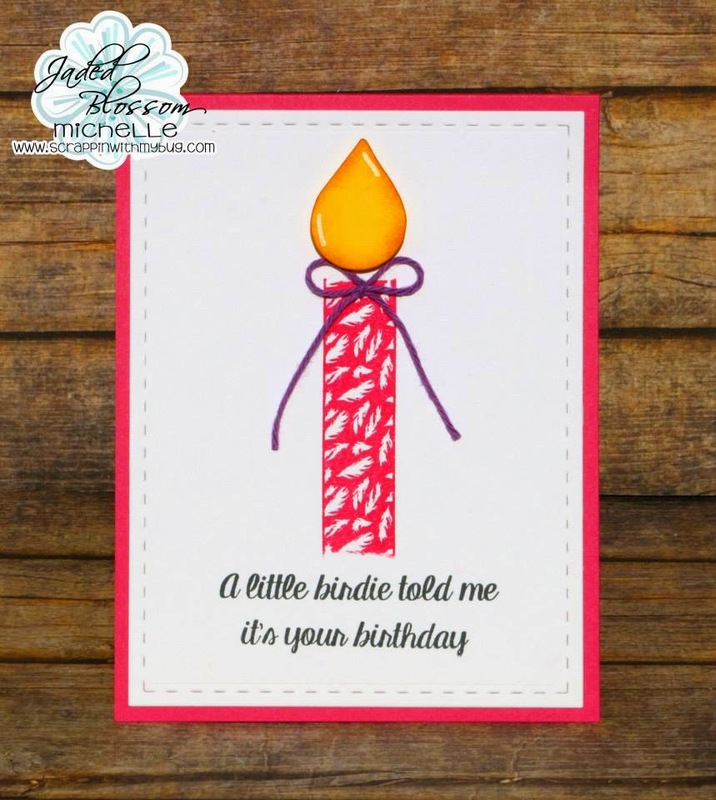 Added some Twine from The Twinery and Trendy Twine to my cards. 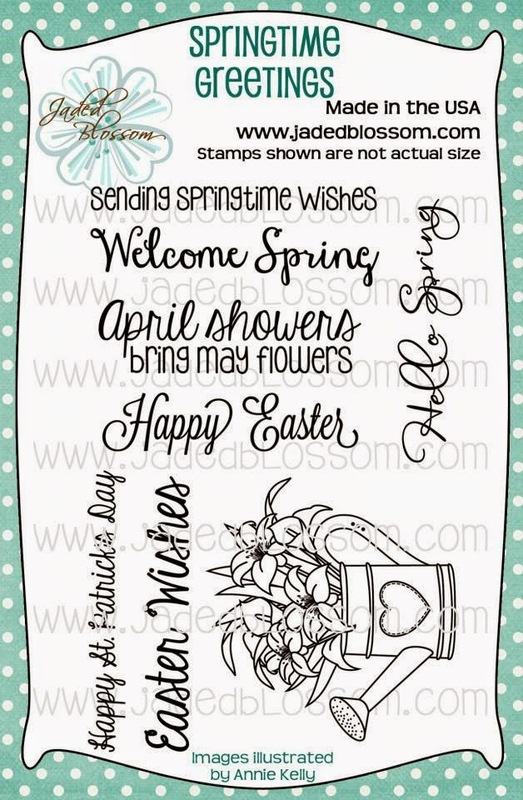 Here is the Monthly Spotlight stamp set. And you still have until February 28th to link up to your February Challenge. You can find all the information HERE. It's Finally Time! 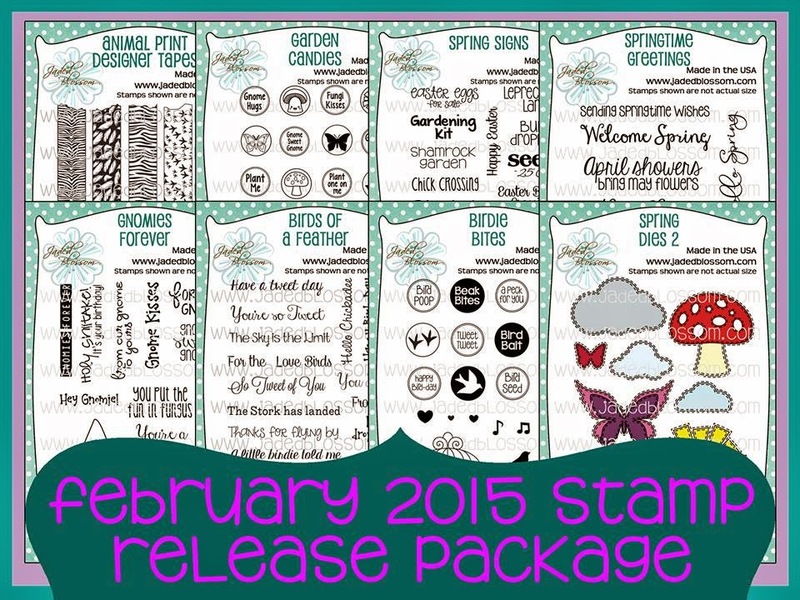 You are now able to purchase our February 2015 Stamp Release. 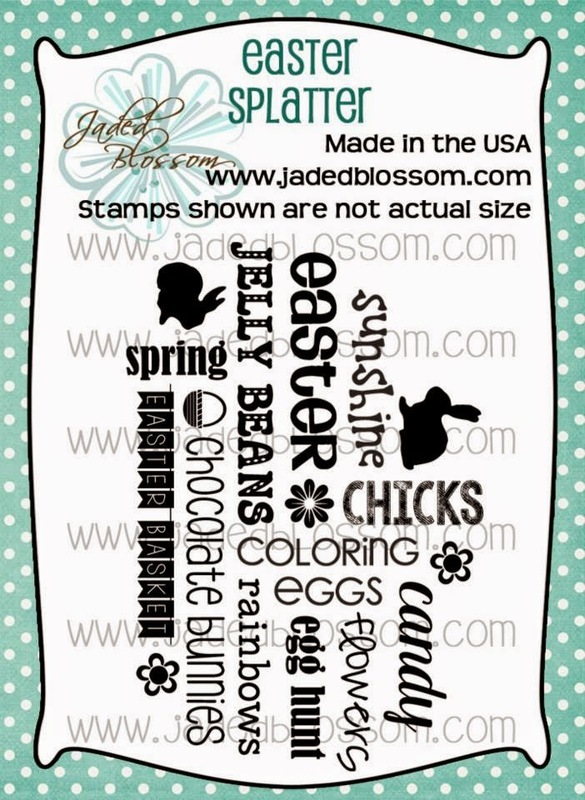 1 - Free 2x3 Stamp for customers that spend $40 or more before Taxes and Shipping! FREEBIE is only available until Sunday 2/15, 11:59pm pst. 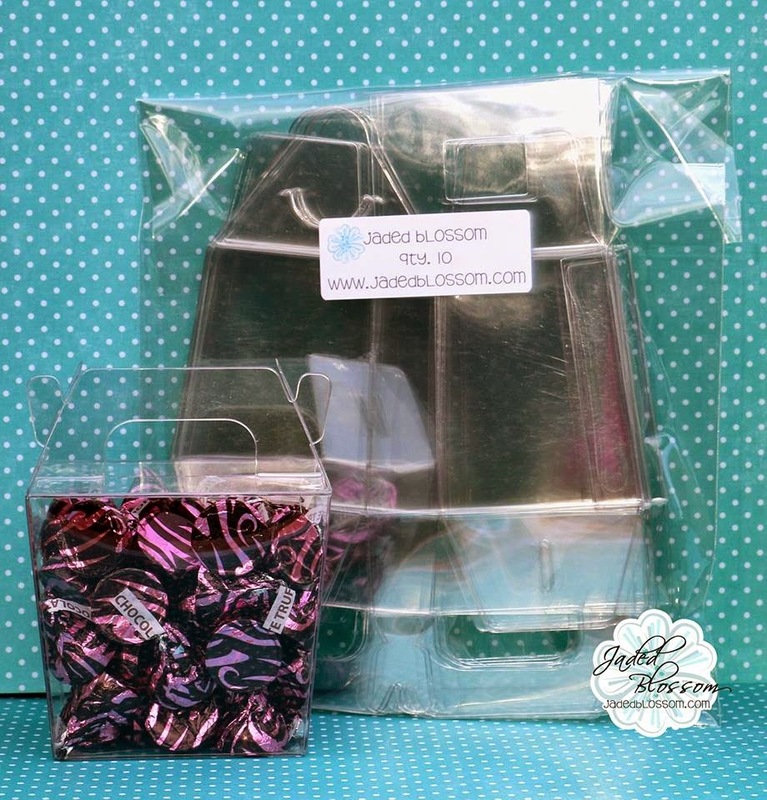 2 Lucky Winners will each receive 1 set of the new Gable Boxes! 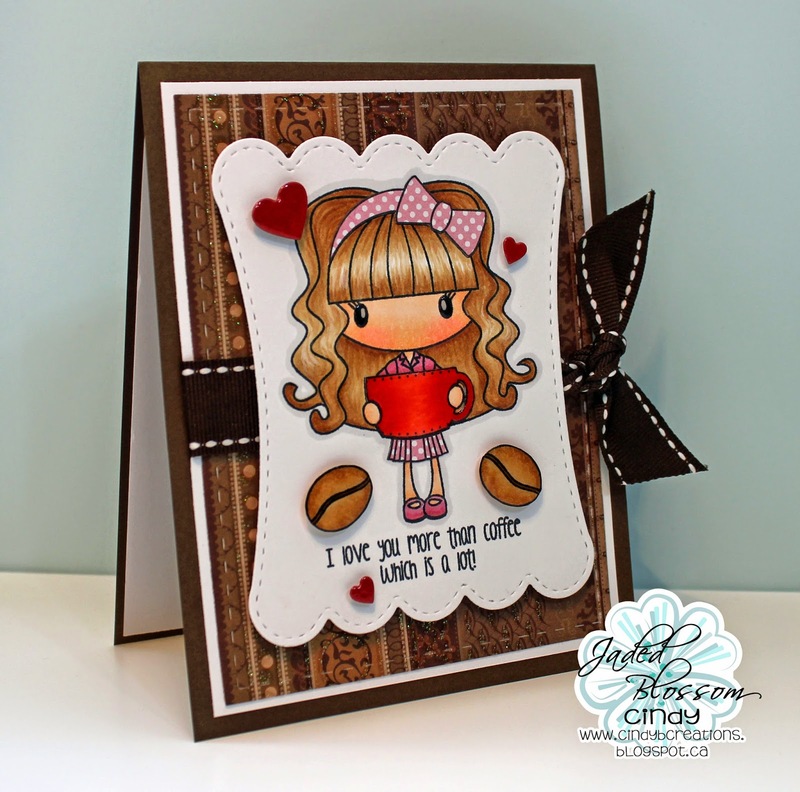 Here are some inspirations from our February Guest Designer and Design Team!